Home > Fiction	> Friday Fictioneers – Blow the Doors Off! Friday Fictioneers – Blow the Doors Off! Here is my story for Friday Fictioneers, hosted by Rochelle. This week’s photo was contributed by Sandra Crook, and this week’s other stories can be found by clicking on the blue froggy. I don’t usually do this, but the photo reminded me of the original “Italian Job” film. I apologise, but my “punchline” won’t work (at all) if you haven’t at least heard the famous Michael Caine quote. However, I’m very short of time this week and it’s today or never. Here is a link to the quote on YouTube, which made me laugh once again. 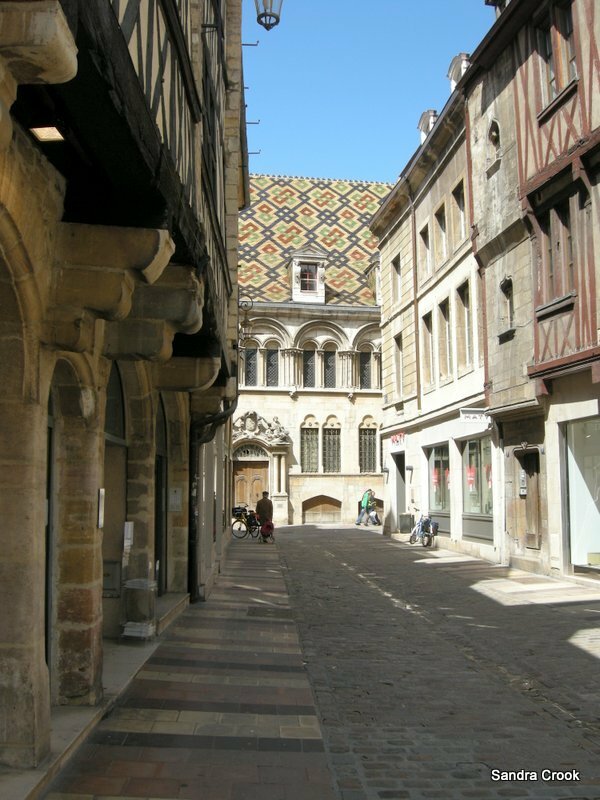 According to the photo’s title, the photo is actually Dijon which is in France. Imagine them naming a town after a mustard :-). Davies screamed into a side-street. Davies steered through the boxes, knocking them flying. “Awesome!” shouted Grant as Davies screeched to a stop outside the newsagent. As they watched, the shutters came down. Feel free to either groan or look blank, depending on whether or not you’ve seen the film :-). I haven’t seen the movie…but I could still imagine the scene. Nice one. I’m glad you could still picture the scene! Am such a fan of Michael Caine! Now I’ve got to see the movie! It’s a great one, from all the way back in 1969! It is a great film and that last line is a famous one! I could picture this scene well…those little cobbled streets should be renamed death traps as anything could come down or up. I certainly wouldn’t want to drive around on them! Quite a few Cornish seaside villages are pretty “tight” too. That clip made me laugh! It’s so long since I saw the film. LOL I’m snorting while trying to stifle my laughter in the library. Getting a few strange looks and one or two glares. I gotta watch the whole movie now. But maybe not until I get home. Oh…that’s the only one I saw. Hah! Now if it were an off-licence I could have understood the haste. Nice one. Great dialogue and I’m pleased to see I’m not the only person who was reminded of Italy rather than France when I saw the photo. I’m glad you liked the dialogue! My kids were fans of the remake, which because they weren’t aware was a re-make, I wasn’t aware was a remake…so thanks for that. Must go hunt for / find / watch now. I must see this film now, love Michael Cane, too. And the story is great, the action, the atmosphere. And thanks to the video, the punchline makes perfect sense. It’s a great film, action but funny, as you saw from the clip 🙂 I’m glad you liked my story! This is very fun. A grand adventure – now I’ve got to see the movie, too.Maybe we FF writers should rent it and watch it together! Wouldn’t that be a hoot? I have not seen the movie, but blowing the bloody doors off is always a good idea! I didn’t see this movie, but now I want to. Don’t they drive around Mini Coopers? I love that car chase in Bourne Identity with the little car. Really funny, Ali. Groan indeed! Though they play the Charlize version a bazillion times per year (and we watch all or parts of it, at lease a million of them) I have had the chance to see the original. Gotta love Michael Cane! This is certainly a unique take on the prompt. I loved the action in it. Thank you for the clip. My first thought was how young Michael Caine was. That was the first thing that struck me, too – how young he was in that film. I had no idea it was 1969! I remember the speed of those little cars and they way they maneuvered them, wonderful job of capturing that. This film probably did more for Mini Cooper sales than anything the company did. They became instant classics! Thanks! I did read the story from the point of view of not having seen the film and knew it wouldn’t work, but I’m glad you liked the story anyway. I had to watch the clip before reading – and I’m so very glad I did. You’re right, I wouldn’t have gotten it otherwise. I think these two are going to have some police after them soon, with the way they’re behaving. Fun story! I thought you would probably have seen in him films. But he’s so young in the clip he’d be hard to recognise from his newer films! What a ride. Well told. Actually, I’m reminded of my own recent attempts to make it to my closest VW agent before closing time to purchase a small part. It took three trips. Love Michael Caine – love the movie. Thanks for the opportunity to revisit it. There’s the 1969 version and the 2003 (?) remake. They’re both pretty good, though I don’t remember much about the remake. I had the blank look too, but still enjoyed the chase scene and the YouTube clip. I’m glad you liked it even though you haven’t seen the film! *Looking blank* … but I enjoyed your writing, nonetheless! Vivid and action-packed. Great dialogue. Fun! I’m glad you liked it even not having seen the film!